A few weeks ago Bea suggested to have another games evening again. So yesterday night was the night. The house was ready for some serious gaming. Bea, Chris, Eileen, Francis, Electra, Simone, Mark and I had a great night, we chatted, had nibbles and drinks but above all enjoyed each others company playing Rummikub, Blokkus and Boggled. Thanks everyone for such a lovely time. Every summer we tend to have a bring and share party so that our members get to meet up and re-connect. This year I combined it with the annual picnic on the lawns of Victoria Homes. As we all live fairly near to this venue and the facilities are second to none, it was a wonderful get together. 14 our of 34 members came, some of whom helped set up the gazebos, tables, chairs and made flower arrangements, others came to join us and brought something nice to drink and eat to share with the rest of the visitors. The day was very hot (27C and has been like this for some weeks now) there was football (England vs Belgium world cup) Tennis at Wimbledon, Bastille day, a 3 day festival on Parker's Piece so there was plenty of competition for entertainment. Harmony, Pavlina, Liz, Paola, Clarissa, Glo, Electra, Helene, Sue and Agi sent their apologies so all in all most of the group responded to the invitation. Not only were we there to have some fun, we also came across some more lovely neighbours to whom we could talk about the Skills Exchange. Let's see if we get some new members. My husband commented on the rather bushy eyebrows lately, so went to the House of Beauty where Fiona very kindly sorted this little issue. Feeling much lighter for it and husband is impressed. Thank you Fiona for sorting me out so quickly. Thanks again for lending us your air mattress. It made our friend's visit so much easier. 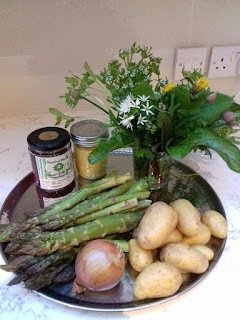 For the last few months I organised a weekly cooking and lunch session with produce from the garden and allotment. This weekly session is attended by Skills Exchangers as well as Newcomers and visiting scholars. A great way to let the gems shine. 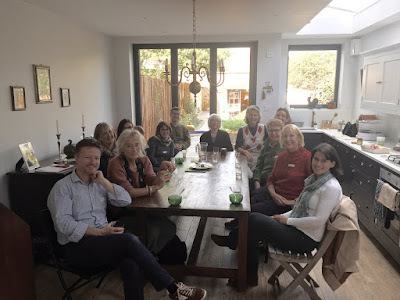 I am grateful to Liz, Mairead and Bea for organising these lovely craft events as these are wonderful to get to know each other and to let the gems shine. 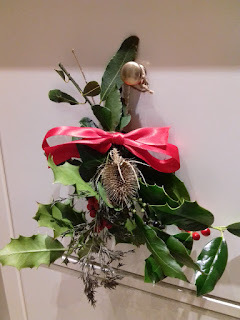 Yesterday evening, Liz and Rob opened their house and welcomed 4 of us to have drinks and nibbles in front of the open fire, before we sat down at a craft table full of lovely materials to get creative. 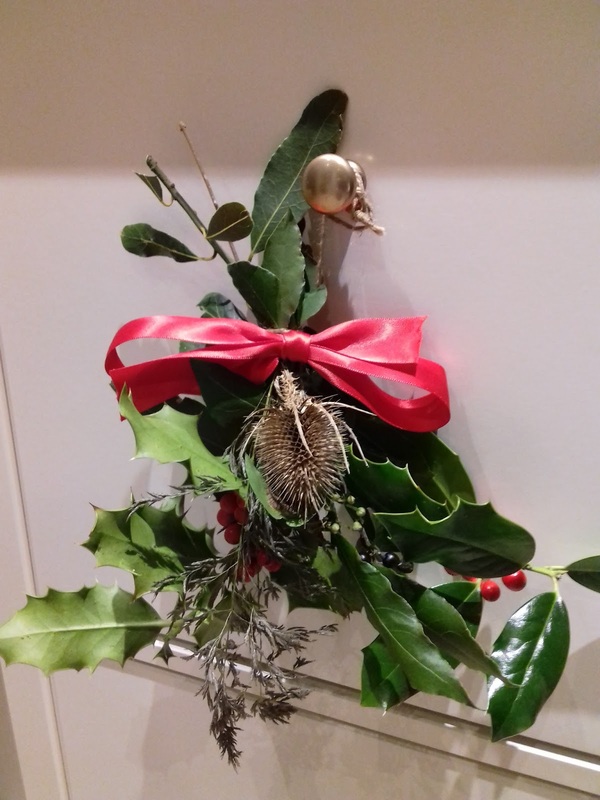 Liz had raided her garden so we could make wreaths and Christmas arrangements. Harmony had brought lots of card,beads stencils and (dream catcher) rings that turned out perfect to make wreaths with. 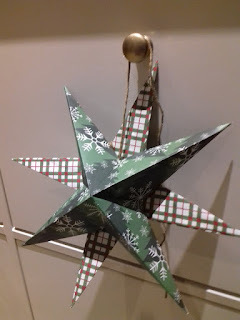 Bea provided Christmas origami paper and both of us made some lovely stars out of it. I wanted to thank Bea and Mairead for a lovely craft evening. A great way to spend my gem and for Bea and Mairead to earn to spend again elsewhere. The gem I got from Anthony for the ironing is going to Bea, who is giving it to Pavlina,who will then give it back to Anthony who will take her to the station. And so the gems keep shining, Hurray! Keep the gems shining and make friends at the same time. Big thank you to Pavlina for doing such a BRILLIANT painting job for me yesterday. It was also lovely to hear about the Czech Republic Christmas customs and food . Cookie swap get together without the swap was a wonderful event! This afternoon I had set aside for a Skills Exchange cookie swap. A few days before 3 out of the 6 people who were going to come told me that they either could not make it or they did not have the time to bake. Rather than cancelling the get together, we decided to share a cuppa instead. It was a lovely meet up. The door bell rang and was greeted by a lovely surprise when I saw Simone who managed to come after all, followed by Bea who had already baked some 'ethnic' GT biscuits before we had cancelled so she shared them with us. 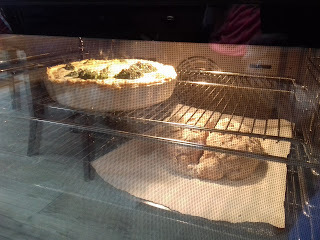 (MMM delicious, well worth getting her recipe), she came with Clarissa, who had just returned from a few months abroad. It was lovely to see her again and hear her stories. Then Pavlina arrived, a well known name in the exchange as she has been active in lending out her pressure washer but above all help members in need of acupuncture and massages. Also in this case, it transpired that some of use could do with her help and sessions were quickly set up. Bea needed a lift for a fair she is about to attend, so Clarissa immediately took the opportunity to offer this to earn her gem, which no doubt she will be spending soon in our group. Bea and Mairead have organised a craft evening next week which hopefully a few of us will attend. 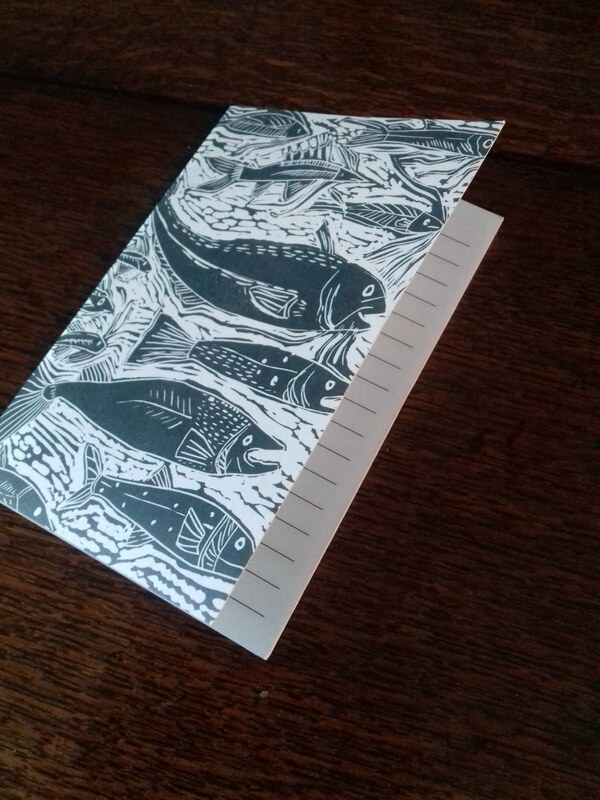 I liked Clarissa's suggestion to make some little gifts to the residents of Primrose Croft, so may attempt that then. 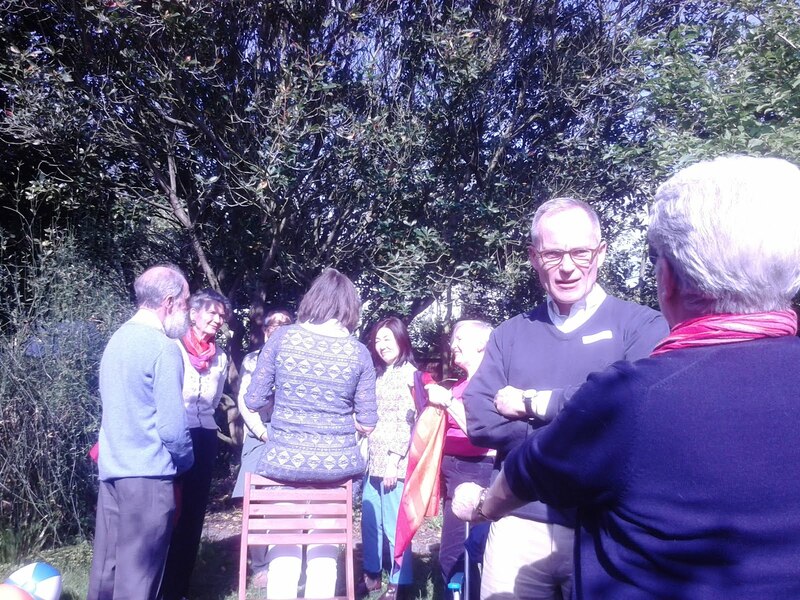 After an hour, we all dispersed, we have shared our biscuits, friendships and ideas and look forward to meeting each other soon. 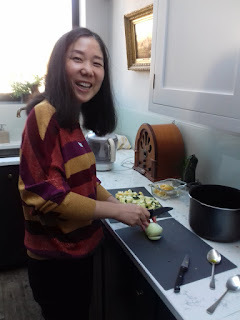 With vegetables in the garden, a love for cooking and the joy of meeting others, I started the From Spade to Plate sessions on Monday. This is a combination of Visiting Scholars meeting local residents at the same time. Last week was another lovely session. Skills Exchangers, Glo, Francis, Eileen, Michael and Carmen came together where we made some Courgette and Spinach lasagne, Courgette and lentil Soup with some delicious Brasillian cheese ball. On the Friday morning Pavlina, Carmen, Paola, Liz A. Simone and Eileen came and brought some lovely cakes, teas and goodies and not to forget their lovely selves. It was a way to get to to know each other a little better and to figure out how we could get more people enjoy being part of the Skills Exchange. We came to the conclusion that people in Cambridge are so busy during term time. With half term in sight I thought it might therefore be an great opportunity to organise a few more socials. So Tuesday we had Mark's story telling evening and Simin, Simone, Eileen and Francis came to listen over a glass of something and some nibbles. On Wednesday morning it was lovely to see Bea for for a cup of coffee which resulted in a skills exchange. I managed to give her a lift that afternoon and she will pick us up from the airport on Monday. Yesterday we had the Cambridge bread bake off between Glo and myself . Glo made tasty soda bread and earlier in the day I prepared mini spelt and rye malty rolls that were baked in the oven to have with Bea's delicious blackberry and apple jam with a cup of tea. A little later after my malty loaf had risen, we baked it on top of the stove in a large pan. Amazing how on a low heat a loaf can be baked within 30 mins. At the end of week I look back with great warmth and joy and am grateful to have met such lovely friends who too want to build a strong and positive community and welcome newcomers with open arms. 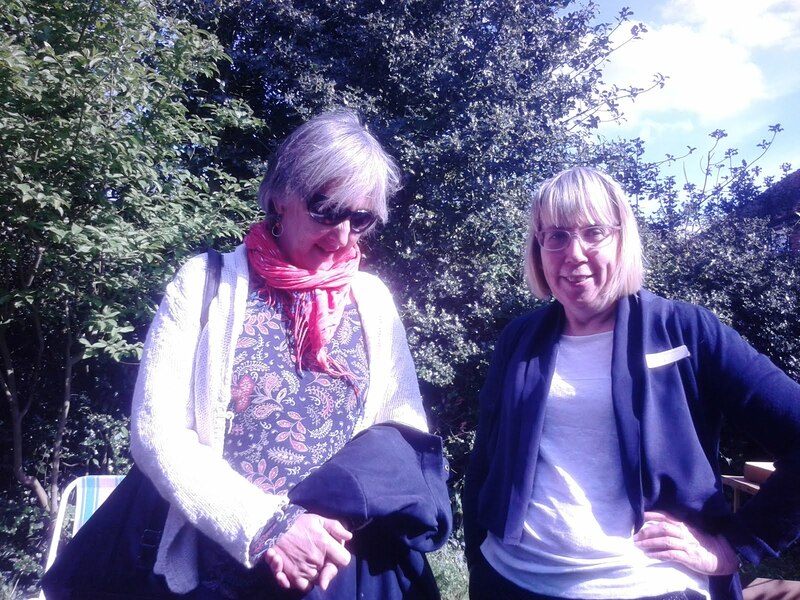 My thanks also go to Glo and Carmen who invited Elisabeth and Franscesco to see the skills exchange in action. I don't use the skills exchange as much as I perhaps could but when I do it works wonderfully. I have done some babysitting, some bookkeeping and the dreamcatcher workshop. In exchange I have had housework done for me. Cambridge skills exchange is a fabulous idea especially if like me you do not have a partner to help with those little jobs that are not worth hiring a professional eg Getting the Christmas decorations down from the loft ! 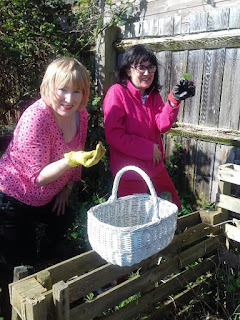 .Also it is lovely to share a chore with someone to make it less so and more fun. It is also useful to hear of other events going on in the area. that you might otherwise miss. I believe that the concept of connecting in a face to face way has perhaps never been more important in this sometimes crazy world. Thank you all who contribute especially Karina. Lift to the station & hospital. & a couple of Tea parties. Unexpectantly my cousin arrived from Holland. normally I would whip up a cake in no time but as he is gluten intolerant I did not have a good recipe that I could make. Knowing that Githa is an excellent cook and is gluten intolerant, I phoned her and asked her if she could make a cake for that day. Within hours, there she was with a delicous Clementine Cake. my family loved it. Githa, Eileen, Pat, Carmen, Clarrissa and Electra joined me for a cuppa and we shared ideas on how we could make more of the NCI on Holland street and after reading about the Library of Things, we thought it would be a natural progression of the Skills Exchange. As we all live in walking distance from each other, sharing items from cots, food processors and tools seems a good idea. I have now added an extra scheet on our shared document called: The Library of Things, where members write their items, addresses and contact details so that others can contact them direct. Not sure yet, if this would be a free exchange or a gem exchange. Will investigate this further. A big thank you to Sally who earned her first gem by giving Michela a guitar lesson. 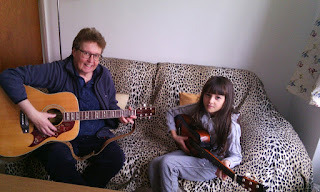 Michela learned the chords and has a printout to practice and two songs to try. Some more musical talent was found during the star making evening as Bea, Clarissa, Simone, Michaela, Eileen,Paola and Karina will be accompanying Cellist Naomi when they will be singing Christmas carols at the local care home. When Harmony learned about our idea she immediately volunteered her tenor voice too. The skills exchange trully is showing off its musical hidden gems. Long may our musical careers last! Yesterday a group of 10 of us came together making origami stars and sharing companionship. After a couple of hours of great guidance from Louise, a lovely glass of wine and hot spiced apple juice and some Christmassy nibbles we all went on our way with stars to adorn our houses. What was so lovely was the fact that 2 of our younger members, Michaela and Szofi came too and spend the evening away from TV, computers or phones. As a matter of fact, no phone in sight. Just time and attention for our friends and ourselves. A great way to get to know each other and organise events to help others in the future. We managed to set up our own mini carol singing choir. 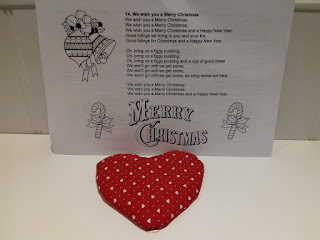 First some of us will go Carol singing with Eileen in St Andrews Church in Chesterton next Thursday and then the week after, Thursday 22nd at 2pm we will go carol singing at Primrose lodge, the care home at the end of our street, accompanied by Naomi (Cello teacher) and one of her young students. We all agreed that this 'workshop' format was lovely. We all learnt something and had a great evening at the same time. Now Louise has earned some gems so she will be spending her gems to keep our Skills Exchange active and happy. It is a great way to keep the gems shining. * PS if you want to do a workshop but are a little short of space, you can always see if I or any one else is willing to host for a gem. It all started with a Gem…..
On the 11th of July 2014 The first Cambridge Gem was exchanged when Karina asked for a lift from Paola to the Station. Paola was happy to give Karina a lift to the station. As a friendly gesture she did not want a Gem but accepted one any way as she was aware what happens when a Gem is able to shine. Karina earned a Gem by helping Liz dig her garden. Pavlina earned a Gem by lending Mark the pressure washer. Karina earned a Gem by providing Pat with painting materials and dust sheets. Thank you to all of you who made it possible for all these people to shine and show what they can do for others. Simin had a great idea the other day; Would it not be nice to have a Potluck dinner with the members of the Skills Exchange? 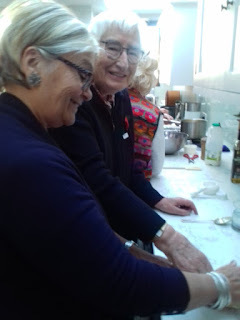 I was so pleased she came up with this as over the years I have found that having these social events are great for getting to know each other and starting conversations and ways to help. So yesterday evening at 7.30 the door knocker became busier than ever. At the end Michael came who managed to eat the leftovers and organised an accupuncture session with Pavlina, promised to go to Glo's and to get down the Christmas decorations from the loft and one day next week have a life coaching session with her. Electra mentioned that she had a chain saw, I could not help seeing the glee in Eileen's eyes,so won't be surprised if those two will meet soon. Louise is planning to earn some gems doing a Christmas star making session so she can have a decluttering session from Glo or myself. Pavlina would like to have a group gardening outing, so a few of us might be seen in their garden soon. I was so excited to hear that after 3 years of waiting I finally got my new allotment. The next day I went to see it at Victoria Homes, just up the road from where I live. Can't be more convenient. The area is beautifully maintained as the surrounding gardens are for the elderly people who live there. This means..... no big tractors or trucks delivering manure and other mulching materials and dumping it in the car park (like we used to have in Nottingham). This time we have to be a little more gentle and tidy. 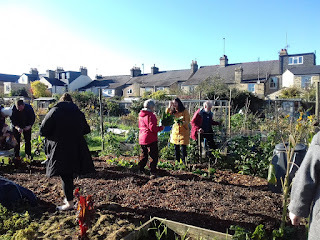 The plot I have taken over was over grown but did not take long to get under 'control', I have noticed though that the soil is very sandy and would dry out quickly if not protected. Watering will have to be by hand (no hoses in sight!) so have decided to have 4 raised beds to put the more tender and water hungry plants in. Last week I mulched the whole allotment with a thick layer of leaves and now wanted to find some soil improver to put in the raised beds. After an SOS to the Skills Exchange. Ben who just lives up the road, told me he had a car in which he transports his dog, wood, and takes stuff to the tip. PERFECT as our little car is new and we did not want to use it for work like this. So off Ben went to Amey Cespa on the A10 to come back and drop off 10 bags of still warm soil improver. He helped me put it in the beds, I handed him his gem and as soon as he came, he disappeared again. I am very grateful to him and will no doubt ask him again later in the season. As get togethers are so important to a strong community, it was lovely to see so many people come to the swap and share event in our new home. Thank you every one for your lovely food and beverages. I love it but have no time... no skills to give... I am working full time... Don’t be shy, give us a try! We often hear these replies when we tell others about our wonderful community of givers and takers! Some people also have problems taking; believe it or not, you have to push them to accept the gems. As we have already explained before, if a gem stays unused in the jar it can deprive others of a chance to shine. If you are sceptical, read the Journey of a Gem! So I am writing this to encourage you to give it a go. You put in as much as you can, there is no pressure here to ‘perform’, we are all friends and we often meet socially. 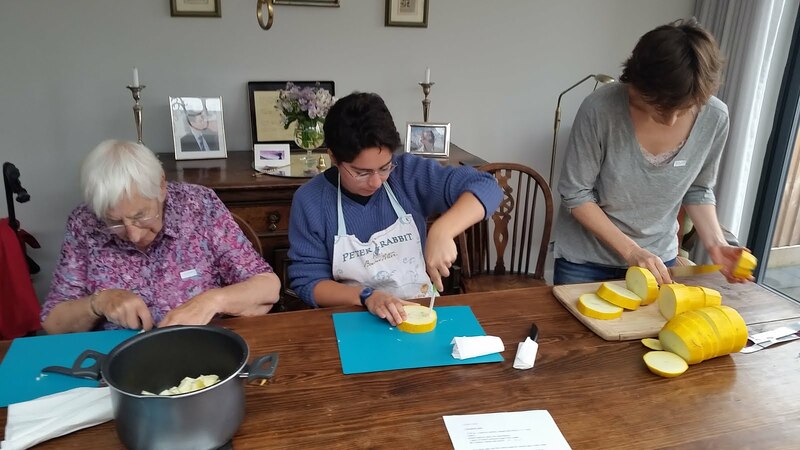 There are also interesting spins-off to this group... some of us are member of the University’s Newcomers and Visiting Scholars and Karina has now set up an Abundance blog if you fancy fruit harvesting as a social activity (no gems but plenty of fruit). Members share their interests and we also have a Craft Club, French-speaking meetups... We also go out to places in the evening to have a drink now and then. Now let’s look at the skills... ‘Skills’ is a broad term in our group. We have some tech people who are happy to help with IT issues but most of us need everyday skills like ironing, walking pets, child-minding, cooking, doing some DIY, sewing, car lifts, gardening, cleaning... Surely you have one of these skills you can share? We welcome you if you live near Victoria Road, Gilbert Road, Histon Road... we have an area limit as we want to keep the group close geographically and manageable. So don’t be shy, give us a try! We are free and friendly. 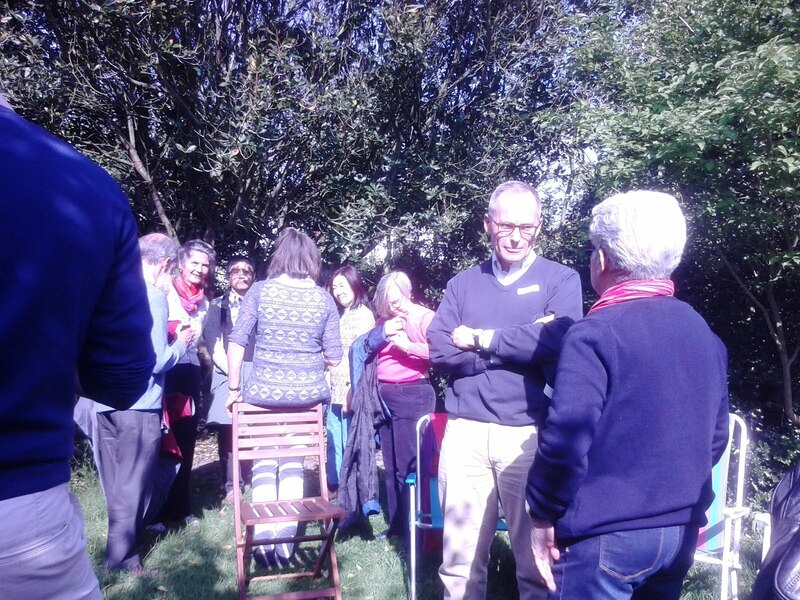 I would like to say a big Thank you to Simone for organising our first Skills Exchange garden party. Originally it was to introduce the group to our Danish skills exchange guests but they had a last chance to go to London before they had to leave again. Due to their stay here, there has been a large amount of exchanges, injecting energy in our group. the garden party was one of those lovely off shoots. Simone had sent out an email to the group inviting us to a bring and share and shop and swap party. People brought their favourite cakes, quiches, nibbles and drinks. The sun was shining and we all had a lovely time. 25 members showed up and Paola's guest, Eileen enjoyed it so much that she joined the following day. Her first exchange was taking the Great Danes to the station early in the morning. A big thanks to Simone for organising it. After years of making elderflower cordial I decided to do a little workshop with the group. We had lots of fun on this lovely sunny June day. 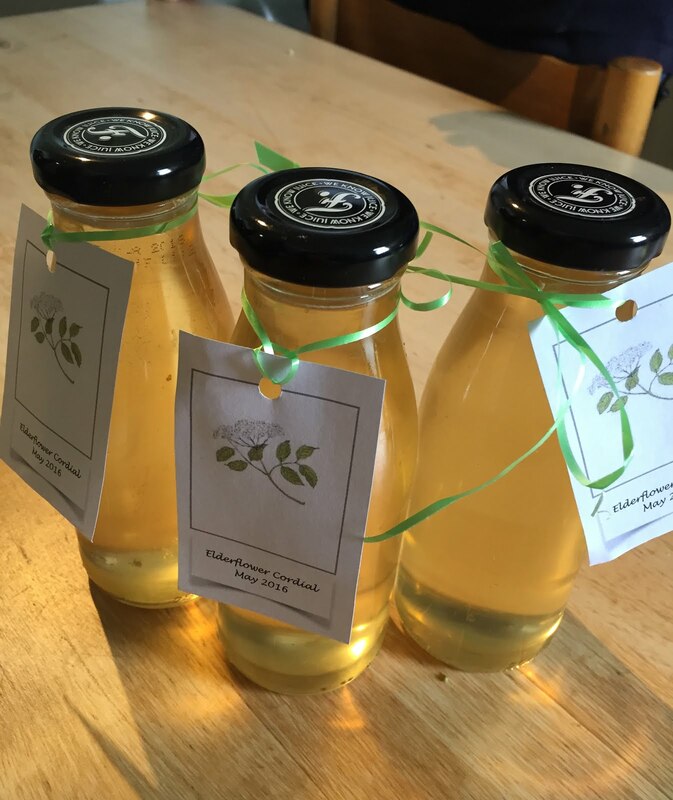 We picked the flowers, made the cordial and the day with the left over lemons and some of the syrup made some delicious Elderflower and lemon marmalade. Thanks Micheal I have my bread all safely tucked away in a bag ready for travelling and look forward to having it in a picnic later if the weather holds. 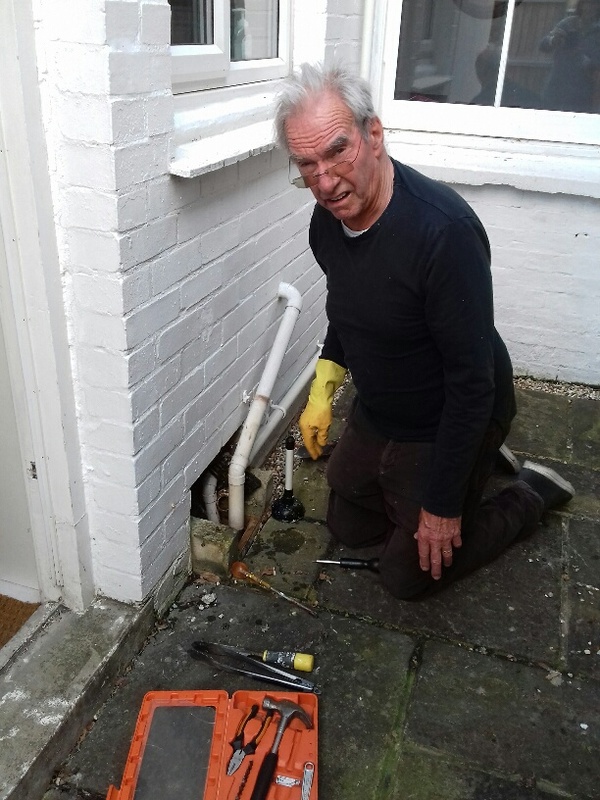 Thanks to the Skills Exchange, we have Michael coming over to help with some weeding, Karina to help with some cleaning, an inflatable mattress to borrow from Pavlina, and some babysitting from Harmony! Very grateful for this help at a particularly hectic time, and looking forward to earning those gems back sometime soon. Here is my compatriot Guido hard at work this afternoon first washing my car, which really needed it, and then digging my raised beds. When he arrived he stayed with me for two weeks, was a very pleasant lodger and paid me in gems which is now earning back. Thank you, Karina, for this really good scheme which you introduced about two years ago and is now growing from strength to strength! Long live the Cambridge Skills-Exchange! Earlier today Michael asked if he could surprise me with a meal for 2. Well at 7.30 sharp the doorbell rang and Michael appeared with a gorgeous looking plate of sushi. Last week he went to Seiko's sushi making workshop and I think his teacher can be proud. The taste was divine too, thank you for this great vegetarian sushi. Hope you can do this again for us Michael. Another nice thing was that there was no washing up to do. Bliss. As you may know Karina’s son Michael and three of his college mates are here in Cambridge until May 20th for a project they are doing as part of their studies in Denmark. I offered to put up one of the young men and Guido, Italian like me, arrived on May 23rd. I hardly get to see him as he leaves at 8 am. and often doesn’t come home till I have gone to bed. On the occasions when we meet it’s nice for us both to talk about things Italian. 3. brought my garden furniture, one table and 4 chairs, out of the shed into the garden. I can now sit outside, weather permitting! So now I have to think what else I can ask him to do… washing my car is definitely one of them! Could we solve our parking problem? Over the years it has become more difficult to park in our street as people use it as free parking to go into town and to work. Which means that many a time our cars end up in neighbouring street. To try and get an idea of which cars belong to residents in this street, I thought of making some stickers. As I am not very computer savvy and I noticed that Thomas needed to earn some gems, I asked him to come up with some ideas. I think they are pretty good. I will now see what the rest of the street things of the idea. Fingers crossed. Thanks Thomas for taking the time to design them. Big Thanks to Thomas for mowing our lawn this afternoon. We had some friends over in the evening and we've spent a lot of time in the garden with the children which would not have been possible with the overgrown grass. It might be possible but it certainly would not look so neat. Thanks again Thomas for helping me to keep up appearances ;-) and the smooth surface for a game of pétanque. On the way there, I saw Aaron who was heading to my house to paint the outside back wall. 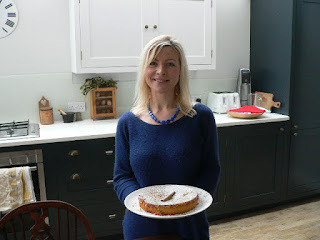 Whilst Simone, Simin and I we had a lovely time with cake and Iranian tea, we chatted about the virtues of our skills exchange and how wonderful it is. Well I did not exaggerate as 2 hours later, I came back to a wonderfully painted house, with Mark and Aaron having a chat over a cup of tea. The scheme is starting to do what it is meant to do. Bringing people together, sharing ideas, manpower and friendship. I am over the moon. What a perfect way to celebrate May Day, starting with the arrival of Michael's beautiful fresh baked bread and sweet chilli Jam! May Day celebrations have deep roots in myth and symbolise the joy of the reuniting of the Daughter and the Mother ( Greek myth of Demeter and Persephone) which gifts us every year with Spring! Happy Day! I too received some delicious bread and chilli jam... Such a treat...and a great joy for May Day. 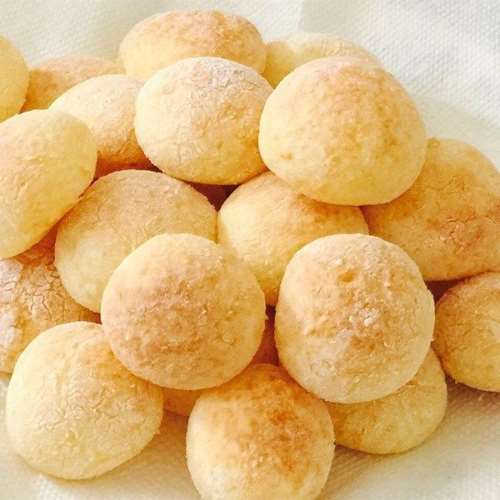 We know when Michael is back in town as that means the smell of freshly made bread. This time, he made loaves for Agi, Seiko and my self. Thanks Mike for a lovely fresh loaf, I will enjoy it. Let me share with you our joy over a beautiful, freshly baked loaf of bread that has just been delivered to our door by Michael. Of course we have tasted it and of course it tastes as delicious as it looks. Still warm...on a day of snow and hail. Michael, thank you very much for the bread. Karina, thank you very much for the Skills Exchange.